All characters and events depicted in this post are real. Any resemblance to persons living is completely true. In dedication to my beloved, Indu. Indrahar Pass (Centre), Moon Peak (Right), Camel Peak (Left) © All Rights Reserved. Most of you must&apos;ve heard of Dharamsala. Many would&apos;ve been there. Some might be acquainted to Indrahar. Very few, scaled it. And all those very few, who have, will remember it for life! 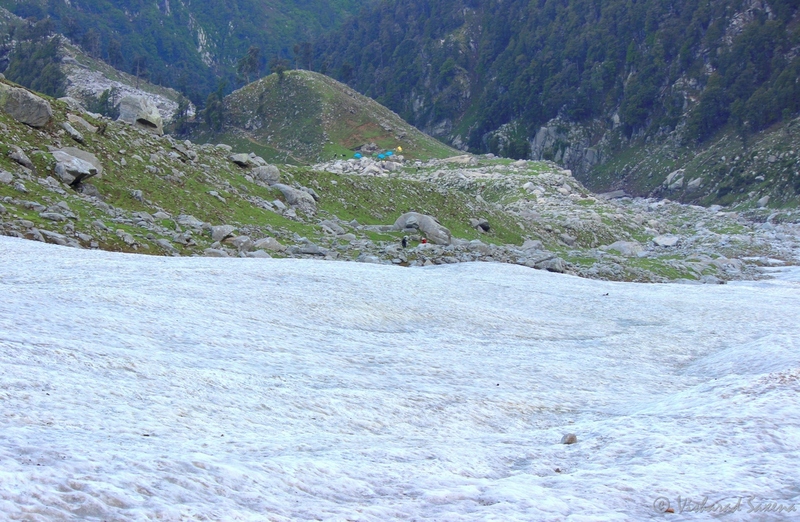 Indrahar Pass is a magic land, that connects hill-stations of Dharamsala and Dalhousie via trekking trail (actually, Kangra and Chamba districts of Himachal Pradesh). Its a mountain pass between two peaks, more famous and mightier Moon Peak, and lesser known Camel Peak. 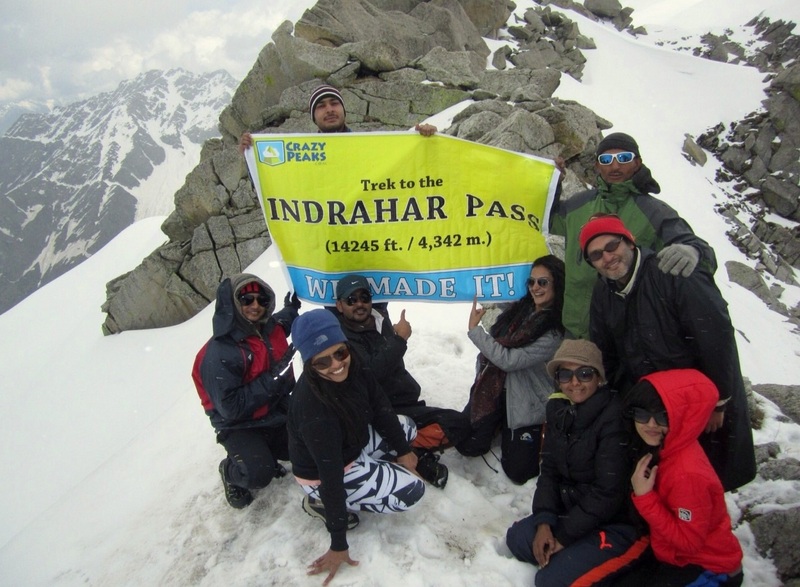 Situated at an altitude of 4350 meters (1000 ft. higher the famous Rohtang Pass in Manali), Indrahar is no easy job to scale. Our job became exponentially tougher, thanks to the thick snow on the mountains which still hadn&apos;t melted off. Going by the local scoops, our group was attempting to be the third one to reach the top this year, except for a few shepherds. First one being an army expedition in March in which only 12 out of 25 could make it to the top. 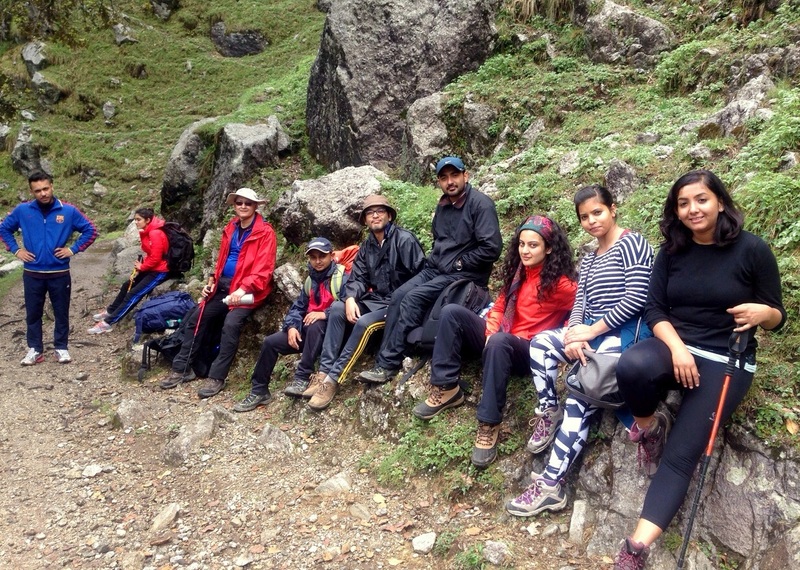 Second being a group of our company, Crazy Peaks that included 5 trekkers (four Indian friends and one foreigner), who were attempting to climb the Moon Peak but could only make it to Indrahar Pass. We could be in the elite league of the enumerable few and more importantly firsts to reach those heights in this year&apos;s snow. This certainly added to our excitement and definitely made us more determined to complete the job. It all started on the morning of 14th June 2015, when all the members of this fresh batch of Crazy Peaks started gathering at the McLeodganj Main Square. We were strangers to each other. Everyone gathered, had tea, greeted each other, quite formally. Few words from Arvind and briefing on basic do&apos;s and dont&apos;s, and we were off! 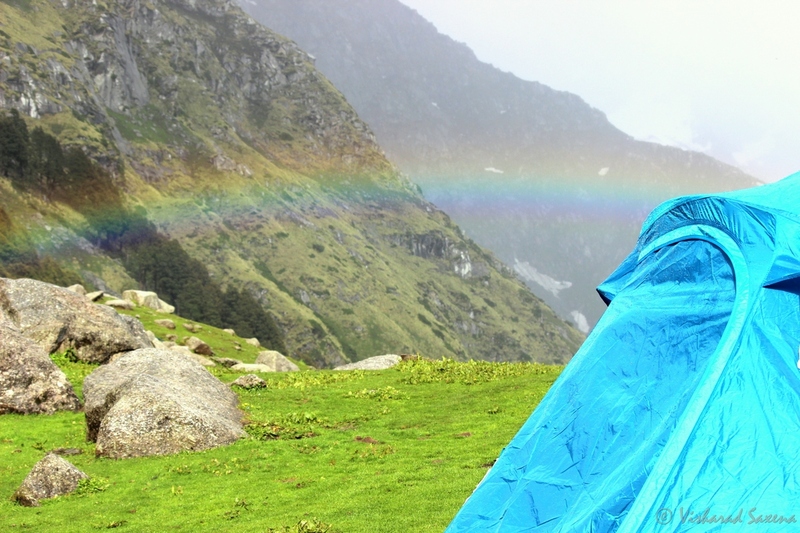 Our target for day one was Triund ridge, which is one of the most popular weekend trek getaways in the country. 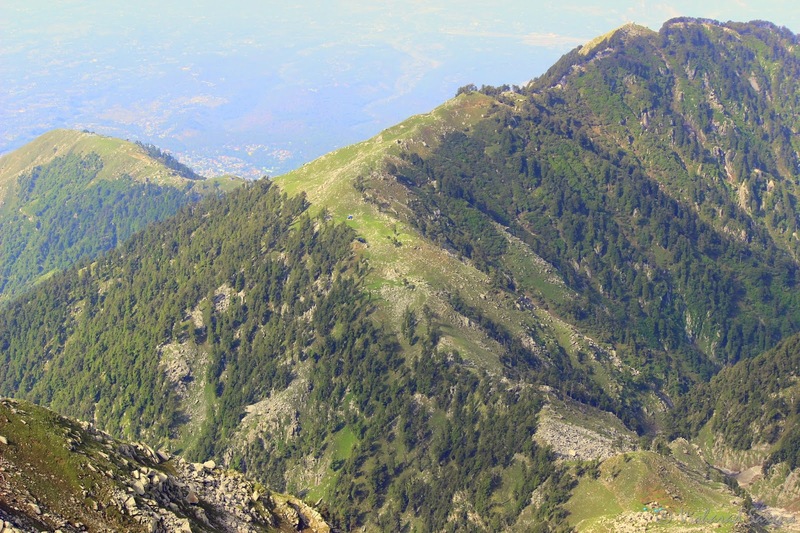 Triund is a beautiful green meadow with staggering views of Moon Peak and Dhauladhars next to it, and Dharamsala and McLeodganj below making them look like a flat ground. We started an hour late at around 10 am from Mcleodganj through a beautiful but steep lane that crosses through the RMC, the Regional Mountaineering Centre. We had just reached Dharamkot in twenty minutes or so and it started to rain heavily. We waited for a while for the rain to subside and it did exactly that. Ten minutes later we took a jungle walk to Galu temple where we had tea and refreshment. Rain gods knew when we&apos;re headed to the pits, and so they turned the tap on again. Man-delays and rain-delays meant we&apos;re running way behind our schedule. We started from Galu temple at around 12:30 pm and had another 4 hours to go easily. As we started our climb, the track became narrower; and cellular network and traces of human intervention (garbage en-route), alike, started to diminish. The trail was though not as exclusive as it was last time. In fact, it was completely opposite of exclusive. 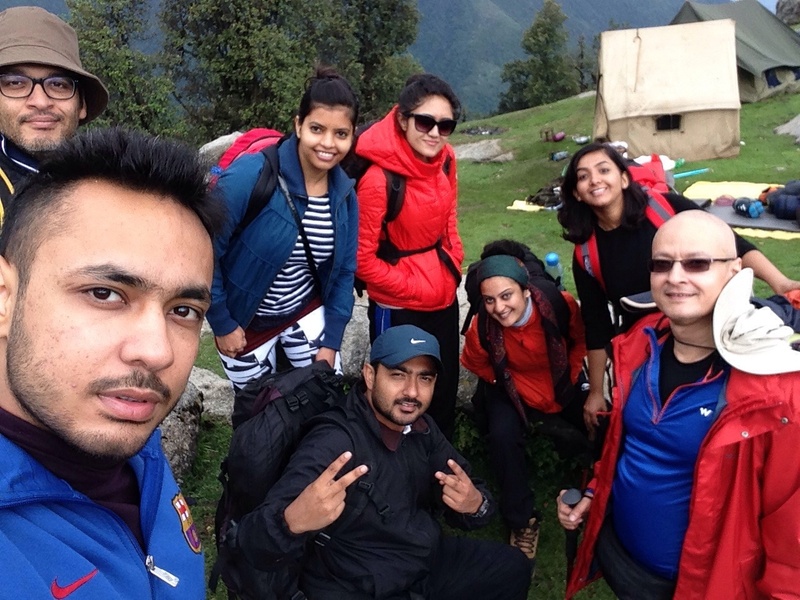 There was large human migration both ways and we expected it not to be a quite peaceful weekend at Triund. 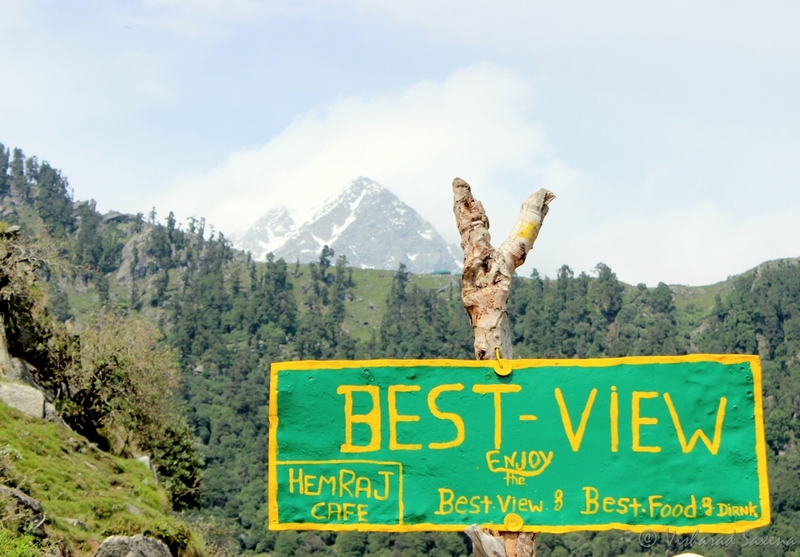 Best View Cafe en-route Triund. © All Rights Reserved. Hungry, we stopped by for lunch at &apos;Best View&apos; cafe. The place had not much to offer but Maggi, Eggs and Breads. I never expected anything more out of such a remote food-joint. I don&apos;t know if the sights add up to the flavour because it was one of the best Maggi I&apos;ve had. After filling ourselves up, we started with our march again. 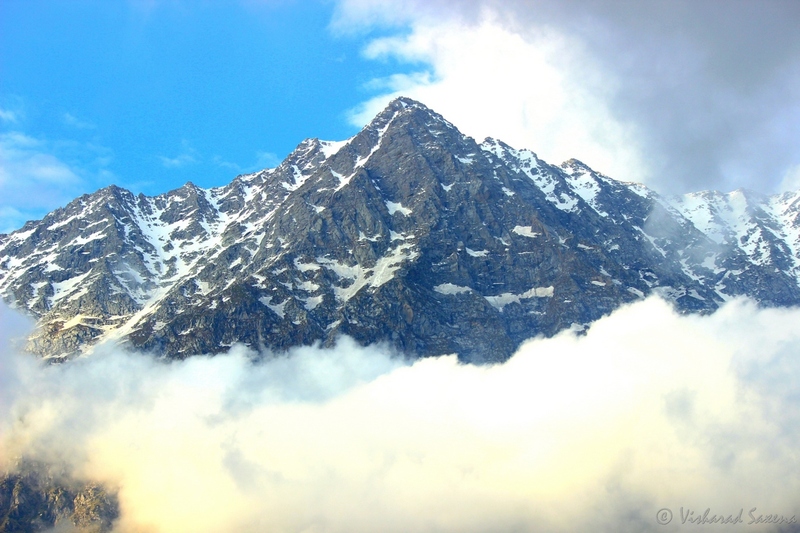 As the Triund top approached, the trail was now steeper than before. My past experience helped me take a few shortcuts to reach the top. We reached by 6 in the evening and had unfortunately, never seen Triund so much crowded before. Abhay and Aritra from Crazy Peaks team who came up for a day hike, will now have to stay overnight for the group reaching this late. We set up our camps 300 mtrs. off the central &apos;downtown&apos; to find a little peace. As we checked-into our tents and changed into comfortable night clothes, it was already getting dark. We all got a chance to interact and know each other over bonfire, soup and dinner. As everyone dozed off, the rain gods again got a chance to shower the place. Next morning was all about clouds and rain. Rain stopped at around 8 am and we started to get out of hibernation. Seeing it as an opportunity, Abhay and Aritra rushed back to McLeodganj. Rest of us, freshened ourselves, had breakfast and got ready for today&apos;s job. Today&apos;s was a short trek to Ilaqa Got which shouldn&apos;t have taken more than 4 hours. Our start, however, got delayed as we waited for the skies to clear up and we started our onward journey only by 10:30 am. We knew it was a steep climb for initial 1000 mtrs as we move up from Triund and making up our mind for the tough job helped us with the same. We took quite a few breaks, enjoying the virgin sights and sudden disappearance of human race from the picture. 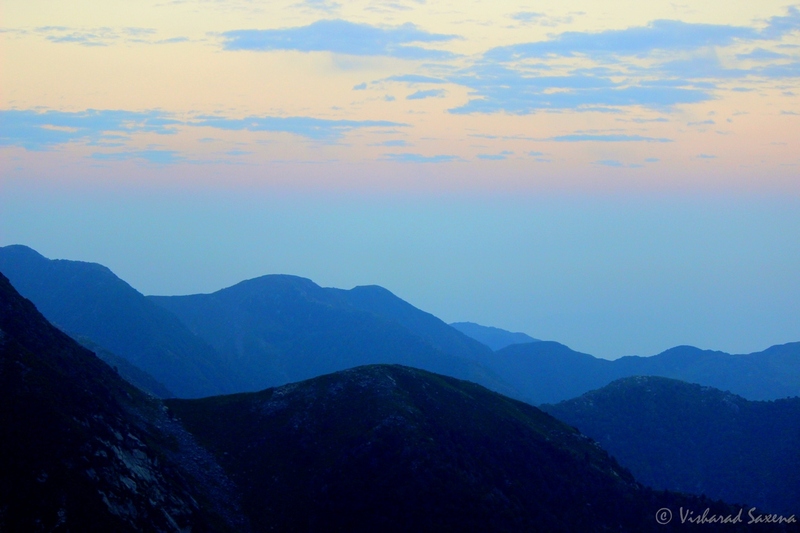 Between Triund & Snowline. In Picture (Left to Right): Jashan, Roop, Ranjeev, Jimmy, Prabhat, Me, Swati, Vandana and Sheenam. Soon after the steep climb, the trail became almost flat and in about ninety minutes we reached the Snowline Cafe, situated around 2 kms from the Triund ridge. It was a lovely green saucer-shaped patch of land, quite different from my last visit when it was all glistening covered in snow. Green helped us in sighting few rare birds like Eurasian Jay, Flycatchers and Monal. After brief halt of about thirty minutes, we picked our heavily loaded backpacks up again (it&apos;s never a happy thing), and started our easy walk to Ilaqa glacier, which will be our base camp for coming two nights. Ilaqa is a descend from Snow-line which we were happy about but then we had in mind that the amount we descend will only add up to our climb next morning to the Indrahar Pass. By the time, we reached Ilaqa, we already had found lovely bonding between us all. I&apos;m actually thinking about all of them, as I&apos;m writing. I consider myself lucky enough to have found such great bunch of people to make the journey even more memorable and joyful! We pitched our tents, Roop tried her hands. Some were unhappy about not making more way by going till Lahesh but later it proved to be the right call. However, we decided to fill ourselves light and quick, and move to the snow for an acclimatization walk. As we were feasting, a foreigner (later found to be a US citizen) came rushing towards us. He was tired and stuttering something to our team. He surely looked a worried man. He was here to seek rescue for his friend, who had fallen during his climb. His friend was injured bad enough to be able to move. As our trek leader Kuldeep ji (who also is an instructor at RMC) and guides Durga and Vinod geared up for the rescue operation, we offered lunch to the messenger. He without any hesitation asked for it and galloped a bowl full of noodles as we could just even blink. We asked if he wants some more; he, again, without hesitation nodded his head yes, and galloped another bowl as we all looked at him. He raised his hands making a gesture of thanks and we knew that should give him enough energy to lead our team to his injured friend. He and our team then moved for the rescue as we looked at them disappearing like ghosts (we couldn&apos;t have covered even a tenth of distance as much as they did in ten minutes). We just prayed that the mission is a successful one. In the meanwhile, as our tents were pitched, rain gods were somehow again informed that we&apos;re bunkered up for the battle and a heavy rain was presented to us. 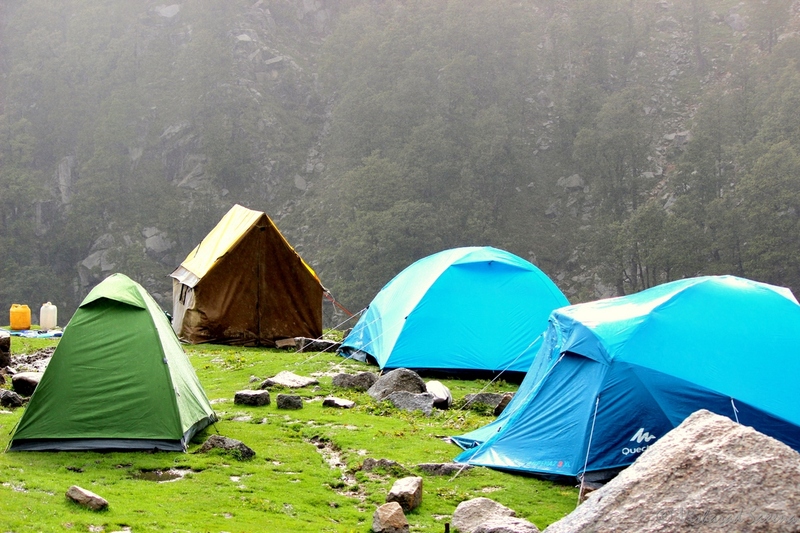 Ilaqa camp in rain. © All Rights Reserved. Beautiful rainbow after the rain. © All Rights Reserved. While we were holding our grounds inside our tents, we felt concerned about the injured climber and our team who was out on a rescue mission. Maybe, soon our white flags were seen, the rain disappeared and it presented us with a deep, thick rainbow at a touching distance. 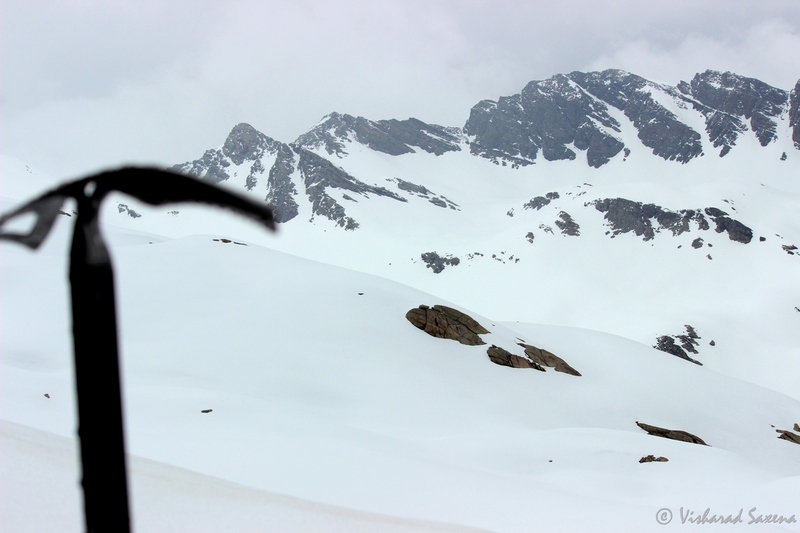 We all kept looking towards the mountains through Zoom Lens of our DSLRs to look for any movement of our team. 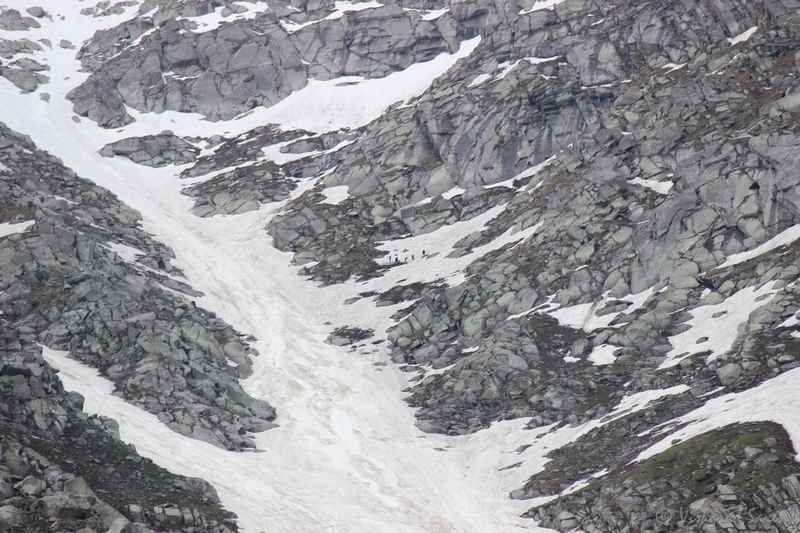 Soon, we could spot our team walking through the frozen ice gullies. Five dots at the centre were spotted by 250mm Zoom Lens. The mission was back on track. We all were very excited to witness a live rescue operation and also felt nice as had we not been here, next help would&apos;ve been three hours away which meant the climber got six extra hours to be saved! As the mission went ahead, we decided not to lose this bright sunny opportunity to get a real hand experience of walking on glacial ice. After some fun time in the ice, we returned back to the camp but there was no sight of the rescue team at all since the last sighting. As the sunlight was fading away and temperature started dropping, we were worried about the team. Every minute was weakening our hopes about success of the mission. All the firewood was drenched in the rain, we were shivering in the cold but looking for any sight of anyone out there. Amazing Dhauladhar Ranges from Ilaqa. © All Rights Reserved. Suddenly, Babu, who was supposed to lead our trek but couldn&apos;t join us on day one, due to injured wrist, appeared from nowhere. That brought some extra hope in me, well acquainted to his experience and skills. With sun almost set, we flashed SOS signals from our torch and suddenly the rescue team returned the favour. Finally mood was again jubilant in the camp. We could see three tiny flashlights descent at a very slow pace. We then moved on to have early dinner and rest before our tomorrow&apos;s early morning climb. After our dinner and after a steady descend of our rescue team, there was no movement in the flashlights at all. They seem to be stuck for one hour at a spot that should&apos;ve been a easy job for our experienced team. We got a little confused, and Babu and I decided to go as a backup help to them. As we moved, Babu pushed me to my limits and we climbed up at a pace maybe I&apos;ll never be able to match again. It was a windy night and shrieking winds didn&apos;t let us give any calls to the rescue team. After reaching very near to the flashlights, the rescue team shouted at us saying they&apos;re fine and coming back soon. They must have seen our headlamps coming towards them. We, however, waited for them. The climber was provided some much needed first aid, brought down and settled in a tent at a safe place. He was out of danger. Our rescue operation was a success! We were overjoyed. That ended our long tiring day on a high note. Next morning, we woke up a little late and could leave the base camp only by 0545 hours. It was the day, our only chance. We didn&apos;t have an extra day for second try. It was now or never for many of us. Initial climb seemed easy and we were covering good distances and things looked bright for our climb. Early morning start to our climb. We were told by Kuldeep ji that if it doesn&apos;t rain, he&apos;ll take us to the top irrespective of any other thing that comes our way. As the slope became steep and as our energy started to die out, our pace became slow, pits became longer and more frequent. We kept checking out the Altimeter in my watch to see how much we need to push further. It was always, too much. Indrahar being a long name and taking a breath extra to call. Swati came up with a nickname, Indu. It soon became very popular! We crossed the Lahesh caves, and it was all white above with small patches of rocks like tiny islands in the middle. We were given instructions about how to step and walk on snow. Our first real test was a big gully of about 200 mtrs., with a slope gradient of about 60 degrees. We crossed it easily. We were now quite confident of walking on steep ice slopes. View from the top. Ilaqa, Snowline, Triund, McLeodganj from midway climb. © All Rights Reserved. Soon gradient increased to 70 degrees and instead of crossing, we had to climb up the slope by digging our shoes from the toes and use of hands as a climber. It seemed easy though for the snow being soft and giving enough grip. The slope that looked easy, now seem to never end and instead become difficult by each step. Weather which was very pleasant for the first three hours of climb, now became foggy and started snowing very lightly. Slippery boulders were to be crossed which sometimes were so loose that any support on them could mean end. Exhausted as we were, and risks increasing with every 10 mtrs. gained in altitude, the figure 4350 seemed next to impossible. But the sight of the top now visible to naked eye with Tridents of Shiva shining against the sun made us not give up so close to the goal. Soon perseverance and calmness led us to climb a extremely loose and steep slope. 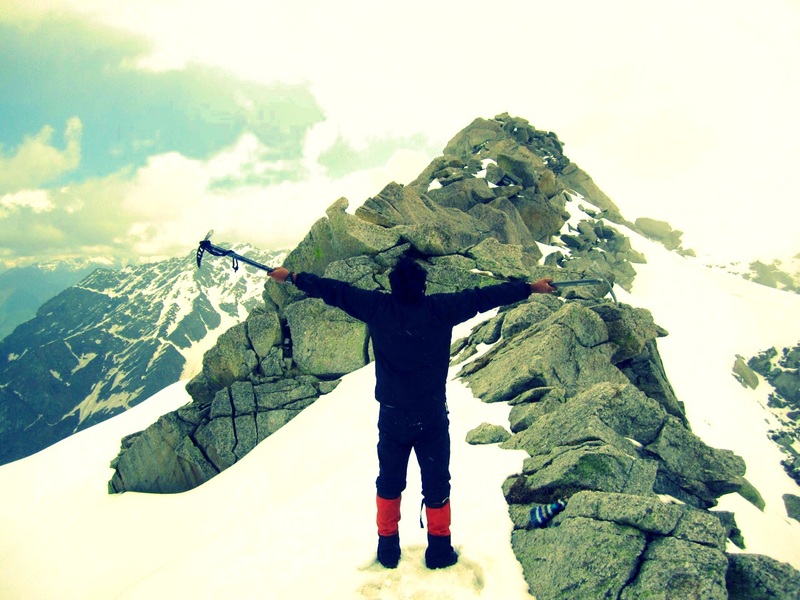 I was second to Kuldeep ji, who was making steps with his ice-axe. After the climb I asked for a rest of two minutes and sat down. He asked me to get up continue, I was told, "Only one minute left." I tried to hear it again in my head. This was it. All the efforts of last three days, all the risks and all that we&apos;ve been through has finally being rewarded with. WE MADE IT. I could only think of reaching to the top as soon as possible. I knew we won&apos;t get more than ten minutes at the top. View of Chamba side from Indrahar Pass. © All Rights Reserved. It was pristine. Surreal. I&apos;ve been to a lot of places, and frankly, I never expected Indrahar Pass to be such a magnificent sight. I was overwhelmed. It was one of most beautiful spread of white I&apos;ve ever seen. I felt so glad to have put in all the effort. So was everyone around. Didn&apos;t express much in words, not for we were tired but we all were overwhelmed by the indescribable beauty, we all were happy to have made so far. Every extra step, the risks we&apos;d never taken before, were all worth it. We were joyed, and thankful to each other for being there and for helping one another in the tough times. We had enough time to capture our joy in the camera and the beautiful sight in our minds and hearts forever. We replaced the word &apos;Cheese&apos; for the camera and were shouting "Indduuu" to pay her a tribute. It started snowing. It couldn&apos;t have been a better set-up for our welcome. We also thanked the rain god, now our friend, for keeping the only hurdle on our way, away. Okay, that&apos;s it. Now what? We&apos;ve to descent all the way down. You gotta be kidding me! First step and we all knew it&apos;s going to be hell of a job. Far more dangerous and difficult than our climb. As we took the snow way up, it had to be the snow way down till Lahesh caves. Babu and Kuldeep decided to use ropes and slide us down, for it being easier and faster. First slide and everyone was tensed with no past experience. Though I and Jimmy had a past professional Skiing experience so weren&apos;t that skeptical. First slide and no one was smooth. Sheenam didn&apos;t use any &apos;heel-brakes&apos; and actually slid as if some F1 circuit. Babu though, jumped in time and stopped her somehow. Next slide, I preferred to rappel than slide and rest all were doing better. We thought of it as some amusement park rides and were laughing at each other and having great fun. Third one was even more easier. Fourth we did without ropes for slope being a gentle one. Now, again the slope was steep and we decided to slide with ropes. We all were coming down gently using heels, all in tandem, and felt quite easy. Suddenly something happened that no one expected. An avalanche was formed in the slope. Ice-axe on which the rope was tied that we were holding on to came out! We were now sliding faster, without any control. Babu, as worried as he could be, was shouting for brakes and asking Kuldeep and Durga to arrest us with ice-axe. I was standing mid-way and was able to stay put. Seeing others not being able to arrest their fall, I held the rope and tried to stop them with my heels. Initial feeling was, oh! it should be easy. NO. Dear lord, heels are of no use. the whole ice sheet is sliding. It&apos;s an avalanche. I tried using elbows, heels, rotating against the rope, of no use. Just when our speed decreased, Swati who was behind me and Kuldeep ji at the top, came sliding down with the avalanche and pushed us further. It was now a free fall. If Kuldeep ji is struck in it, I thought it&apos;s serious now. Babu in the meanwhile kept shouting asking everyone to keep trying. So were we. We had a fall of 200 ft. and there was a big boulder right in front of us. No one gave up. I could see everyone trying whatever they could do to stop. 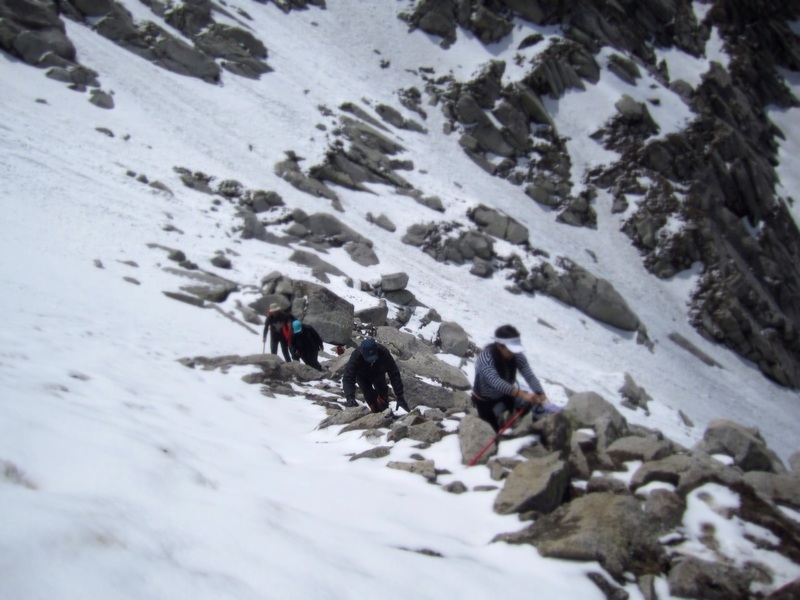 Babu told me later that he wanted speed to slow a little and turn everyone through the gully of snow between the boulders to the next patch of snow. We were now at a striking distance. Maybe 10 ft. from the boulders or maybe 2 seconds from crashing. We stop. Power brakes! It was nothing short of a miracle. Somehow, where all our efforts were futile in front of nature for so long, we got arrested to rope in a split second. Durga who was still at the top, saw the ice-axe (to which rope was still tied), somehow held on to it and hit it hard on the slope, and we stopped. We didn&apos;t move a muscle, anyone of us, leave saying anything for at least one minute. We were scared, any movement can make the snow to slide further. Kuldeep ji, though, felt quite normal and got up and kept asking us to get up and shift to rocky side away from the snow. One by one, each of us were shifted to a safer place. Wait. Not everyone could hold on to the rope. Sheenam trying to help Vandana, lost her hold and continued with her fall. Babu pushed her to the small gully and jumped like a Leopard to hold and save her. Minutes later, we heard Babu saying, &apos;Sab Theek Hai, Tum Theek Ho?&apos; (We&apos;re okay, are you all fine?) We were as glad as we could be. But the problems weren&apos;t just over yet. 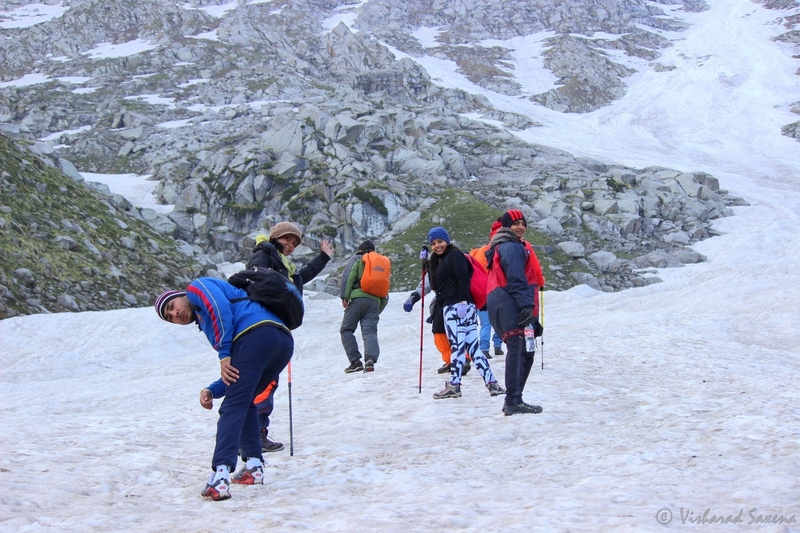 Vandana was apparently suffering from hypothermia and Prabhat&apos;s leg had almost given up. I gave Vandana my jacket and woollen cap. We had to get ourselves down at the earliest. We started our walk with tiny baby steps, crawling at places when we thought it to a even a little dangerous. Glad, no more snow. We were down, enough to avoid snow now. 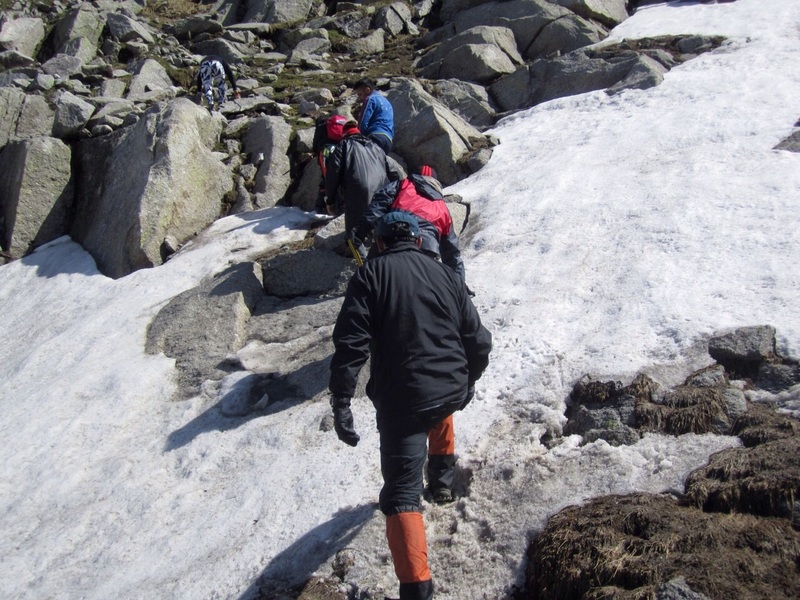 Though there were a few patches of snow which we crossed easily. We again kept checking the altimeter. The same which was not increasing while going up, seem to have stopped while coming down. Why the hell the altitude is not coming down much? It was around 4 pm already. We were quite down now. We had gained some of our lost confidence. WTF! Ice, again!. Please tell us there&apos;s another way round. The first snow patch of 200 mtrs. that we crossed was again to be crossed to reach to Lahesh caves ridge. It looked scary.Kuldeep ji was leading us making steps for us to walk. Jashan and Jimmy behind him couldn&apos;t place a foot due to memories of avalanche. Roop was the leader now, she without any signs of hesitation said I&apos;ll go. She&apos;s one brave-heart and everyone could now only thank her to take the lead. We all crossed the patch easily but very cautiously. Now it was only solid rocky trail that too easier one. We all were happy. Rain god saw us reaching at a safer place and sent some showers our way. We didn&apos;t want even a drop as some of us were already shivering with cold. We continued our way down. Each step gave us confidence and helped our speed a little. Me, Durga and Swati were leading, followed by Roop, Jashan, Jimmy and Vandana. Prabhat had his leg injury back and was walking slow with Kuldeep ji at the back end. We three leading had time and took a detour to the Lahesh caves. It&apos;s a small cave with a capacity of 20 people. Small traces of human settlement (garbage) told us that it&apos;s popular camping site. We came down, Roop was already far ahead. Sight of our basecamp while descending. Babu told me she could be a great climber if she&apos;s trained. Durga was next, me and Swati followed. Finally we reached the campsite. Luckily, fire was lit, enough logs were arranged for to go on whole night. Sheenam was already there. She was quiet. I asked if she&apos;s crying, she replied, she&apos;d already enough and now she&apos;s absolutely fine. I had no jacket (given to Vandana) and all my clothes were wet. I was shivering badly. Vandana, Jashan and Jimmy joined us around the fire. One hour later, Prabhat and Kuldeep came. Prabhat&apos;s injury had aggravated and had to be given pain killers on the way. We all were here, sitting around the fire and happy now. 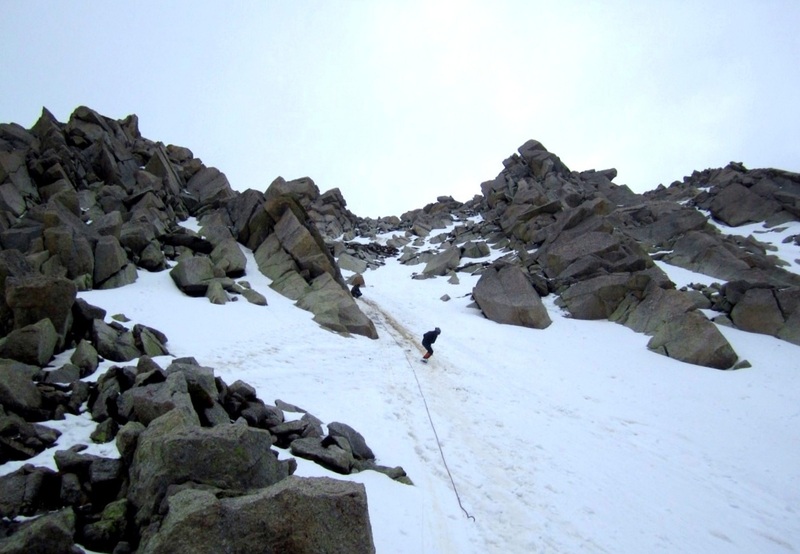 We climbed, climbed with our hearts out, we reached at the top, witnessed magnificent sights, experienced unforgettable moments, and survived an avalanche! It was unbelievable. Out of this world. Everyone dozed off in their tents and me and Babu went to nearby cave for resting our tired body. Moon Peak and Indrahar Pass, next morning, after the climb. Next morning was bright and cheerful. We got up late, sun was out. Clothes were almost dry. We had some of the best Parathas we&apos;ve ever had with huge amount of butter. The sight of Indrahar Pass was magnificent as always. We clicked a few pictures and made our way back to our homes. Return was far easier than we anticipated. In ninety minutes, we were at Triund where we had tea. It was 11:30 am and we decided to move on and have lunch mid way. Me and Roop continued to pick garbage from on the way, as I always do while returning. The same cafe where we had our lunch treated us with half an hour long break, and some Maggi and eggs. We now didn&apos;t want to go back. I&apos;ve travelled with so many different teams, being my job. Never before had I met such a strong-willed, nice-hearted team, warm team before. No one knew other some 75 hours ago. I felt connected to them since ages. As we had to, we continued with our way back. We all met at our small office in McLeodganj for a final cup of tea together, for now. We thought of celebrating our achievement, good times and friendship with a small dinner and a few drinks, but everyone had their plans already made. We hugged each other goodbye. Tickets were booked and so everyone left, but Jimmy, Jashan and Roop. We met that evening over drinks and dinner. Had a gala time and we all raised toast to our beloved &apos;Indu&apos;. Thank you for everything, my love!